The best way to get to know a community is by scheduling a tour. 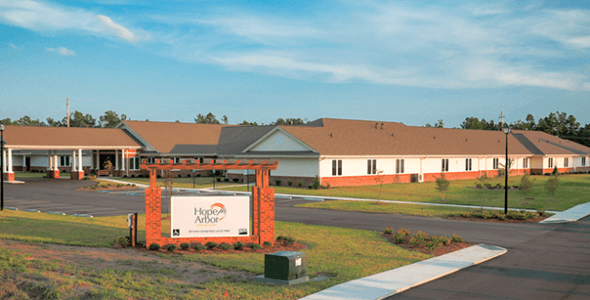 See the facilities, meet the staff and residents, and get a feel first hand what it's like to live at Hope Arbor of Loris Assisted Living. Hope Arbor of Loris Assisted Living is a hidden gem, located off the beaten path and away from the bustle of the busy Grand Strand. Tucked away in the quaint town of Loris, it welcomes you with intentionally designed living spaces. Plus, the area's mild climate allows residents to take advantage of landscaped courtyards, walking paths, and screened porches. All-inclusive Pricing- Regardless of the level of assistance you require, you'll appreciate an all-inclusive pricing structure that covers three delicious meals a day, medication management, ongoing events and activities, housekeeping, laundry service and a transportation van for scheduled outings as well as trips to medical appointments. Premiere Locale- Located near Myrtle Beach and all of its attractions but nestled just outside of the hustle and bustle. Hope Arbor provides a peaceful small town experience. So if you want a night on the town or a quiet evening with friends, Hope Arbor offers variety in its full social calendar. Three delicious meals a day plus snacks, means you can always enjoy food and good friends- just down the hall from your apartment. Activities- Staying active is the goal at Hope Arbor. You can listen to live entertainment, create crafts and artwork, play cards and other games, join a religious service, or just rock on the front porch. The Hope Arbor Team- While you'll fall in love with the peaceful location, you'll quickly learn that the greatest asset at Hope Arbor of Loris is its team of dedicated and passionate staff members. The Hope Arbor goal is to ensure that all valued residents enjoy an engaging, enriching lifestyle every single day.